Human creativity is limitless, but the beauty of our active minds is often hidden inside our heads... until now. But not anymore, now there are the ways to use a BCI device to show others how active your brain is. Magnetic Mind is an impressive project that translates brainwaves into kinetic art, using a NeuroSky MindWave brain-computer interface headset, an Arduino, an electromagnet and suspended ferrofluid. So nothing else but common household stuff. With this fairly unique setup, Lindsay Browder, creator of the project, is able to control an alien-looking liquid in a fishbowl with her thoughts and attention. 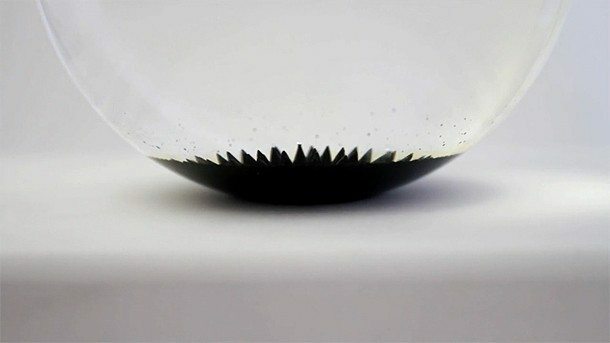 The ferrofluid follows her mental activity, changes shape, grows tiny pyramids and relaxes again, doing this based on the user’s real-time brain activity.